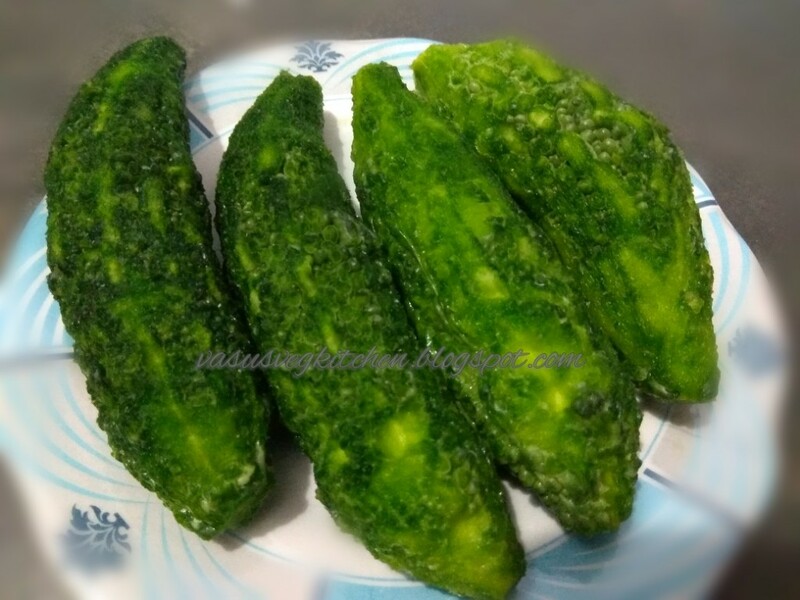 Bitter Gourd which I prepared came crisp outside when i prepared and became smooth after some time. 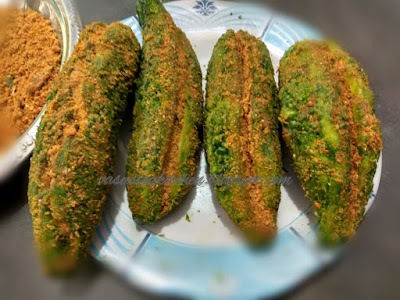 If you deep fry bitter gourd before filling masala it taste good and stay crisp for long time. As I got big size bitter gourd in market so I did not deep fried. 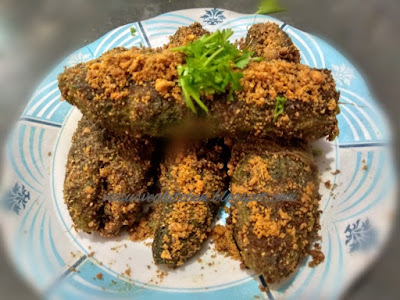 You can use small size bitter gourds for this recipe. 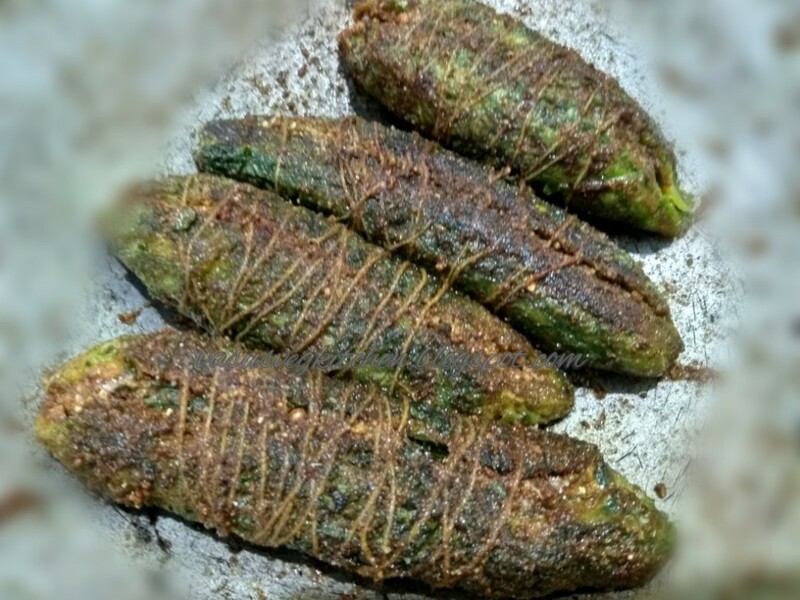 You can deep fry the bitter gourd to get crispnesss. And coming to filling its different in different regions and every home 😊. Today i am using ground nuts masala powder for filling. You can also fill vulli karam(onion masala) , kobari karam ( dry coconut masala), roasted chanadal masala(putnala karam), fried onions etc., It depend on the taste how we like and ingredients present at home at that time. Will post all the varieties soon 🤗. Thread to tie bitter gourd after filling. 1) Fry groundnuts and remove the skin. 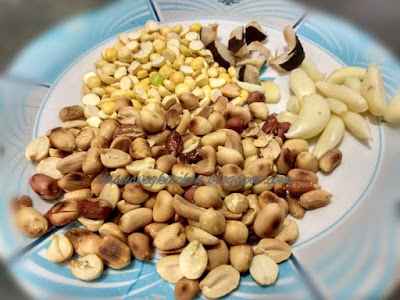 Skip you have roasted ground nuts. 2) cut the edges of bitter gourd and scrape/ peel the rough part of bitter gourd. Its optional you can also use without peeling. You can also cut only one edge of bitter gourd. 3) Slit the middle part and remove the seeds. Rub ample salt both inside and outside and keep it aside for 20 minutes and start preparation for filling. 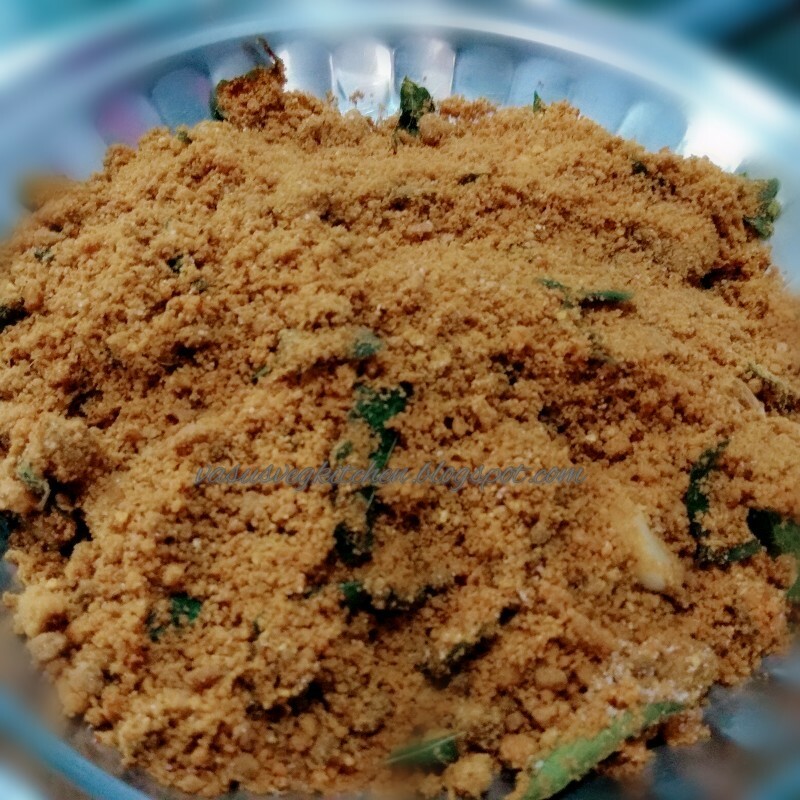 4) Take a mixer jar add roasted ground nuts, fried chandalam dal, dry coconut and make it powder. Now add garlic and grind it once. Take the powder in plate. 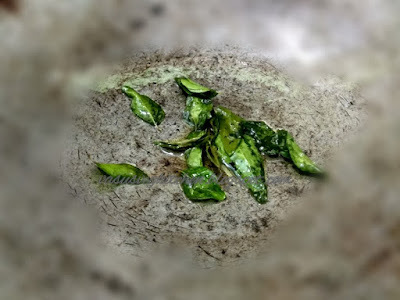 5) Take a pan add oil, once it heat add curry leaves and fry it well. 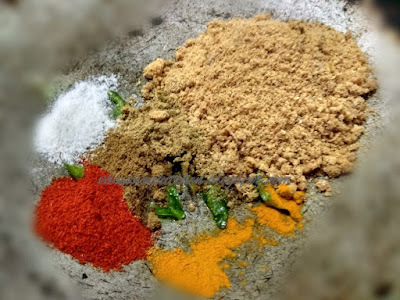 6) Now add red chilli powder, turmeric powder, coriander powder, cumin powder, salt, prepared ground nut powder one by one and fry it on low flame. 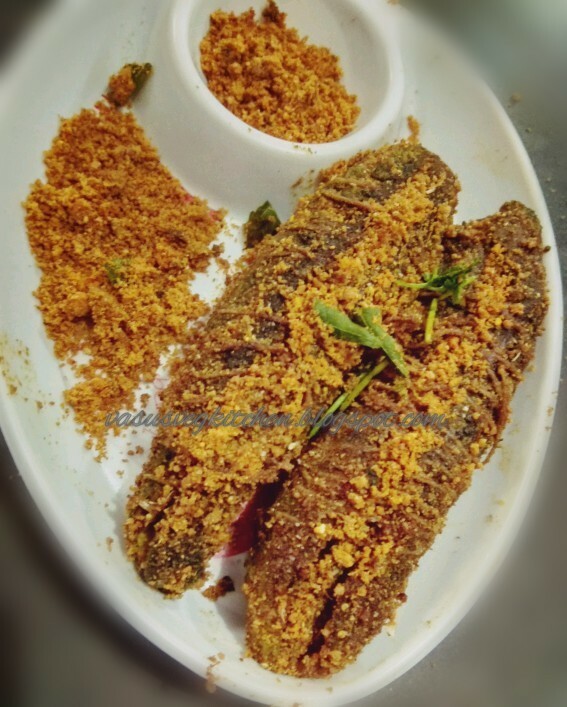 7) Take fried masala in plate for filling. 8) Wash the salt coated bitter gourd with water and fill the masala in bitter gourd. 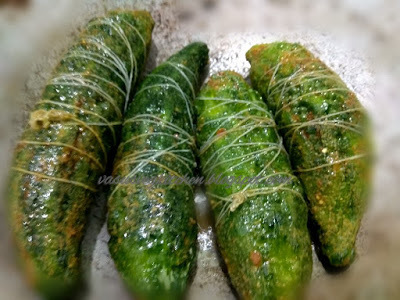 9) Tie the masala filled bitter gourd with thread tightly so that the masala do not separate from it. You can also skip this step, but preferred. 10) Add oil 4 tsp of oil in pan, place the bitter gourd in it. Close the lid for 3 minutes. 11) Open the lid and change the sides, so that the bitter gourd cook well all sides. cook it on low without closing lid as already bitter gourd became smooth. 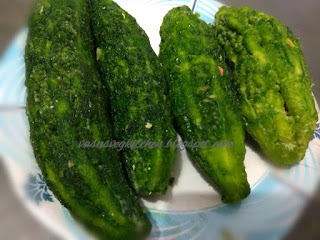 12) Once bitter gourd cooked well, add the remaining masala powder( Its optional). 13) Take stuffed bitter gourd into plate, and garnish with coriander leaves. Do not forgot to remove the thread. 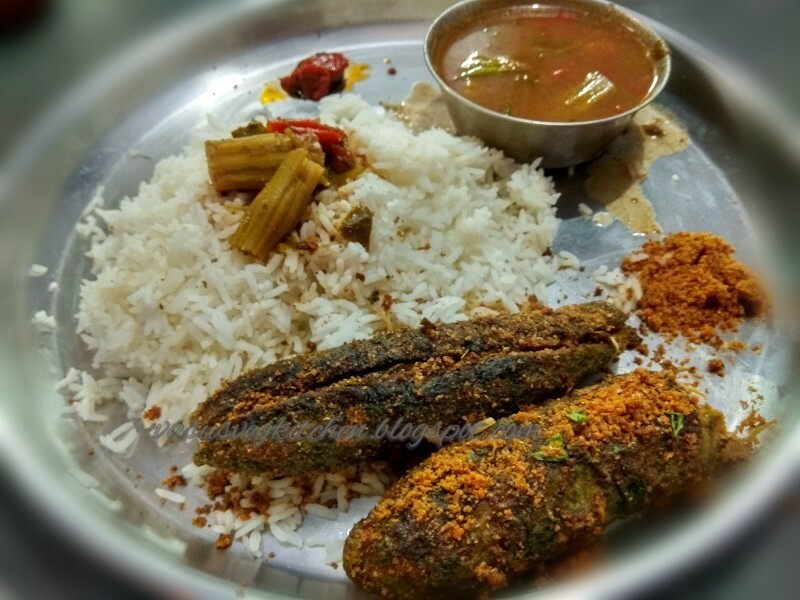 Stuffed bitter gourd goes well with steamed rice and as side dish for rasam rice or with soft chapathi's. 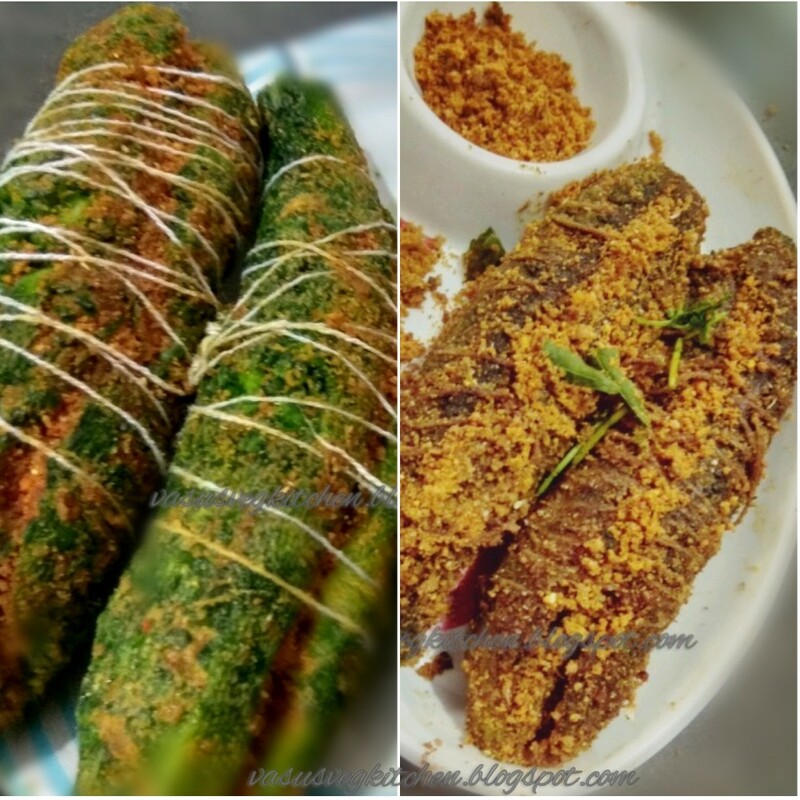 I prefer to have this with hot rice by adding melted ghee 😋😋. 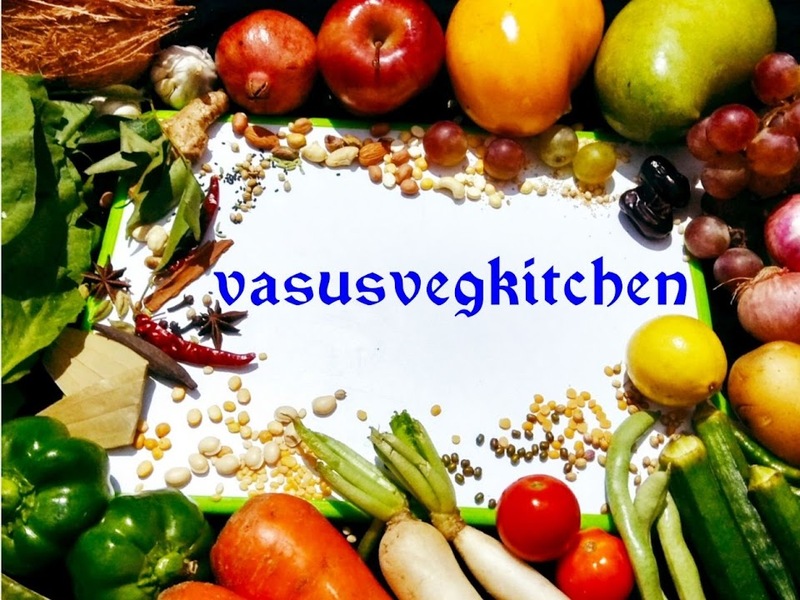 Today i had it as side dish for drumstick rasam and rice. ◆ Peeling the bitter gourd is optional. ◆ You can use the bitter gourd seeds in stuffing. After adding curry leaves add bitter gourd seeds fry it well and then add remaining masala(in step 5). 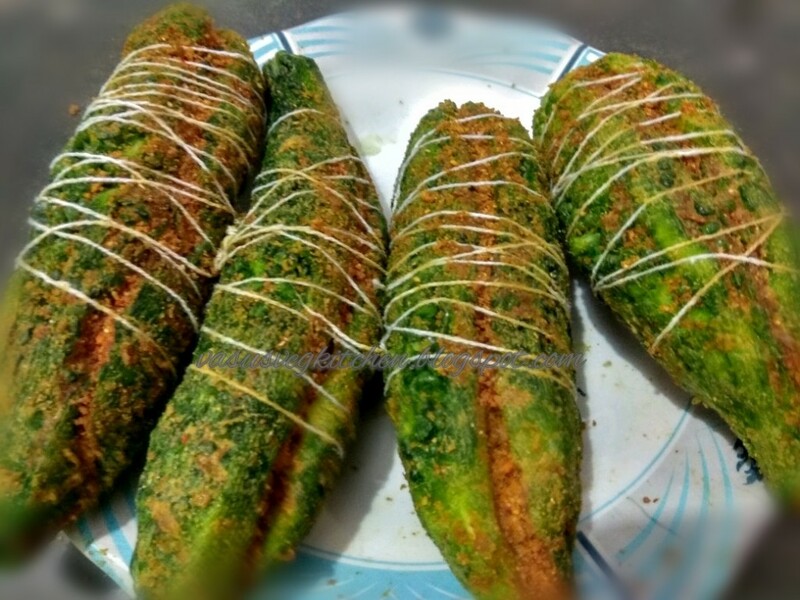 ◆ You can also cut bitter gourd half or small size and fill the stuffing. As shown below but do not slit in middle, masala will come out while frying. ● Select small size bitter gourds. 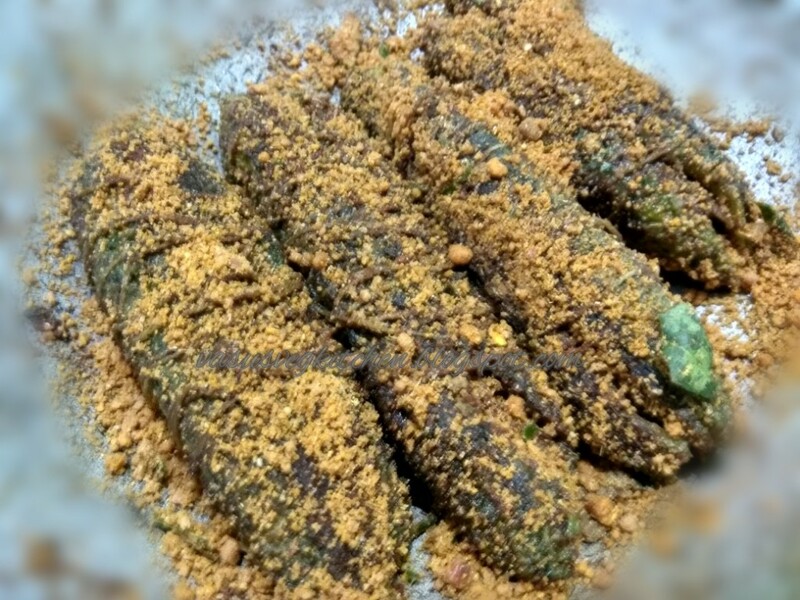 ● Deep fry bitter gourds to get crispnesss (before adding masala). But it consume more oil. Also follow me in facebook @Facebook . Also drop your feedback in comment section in blog or in facebook 🤗😍. Your post is very interactive. 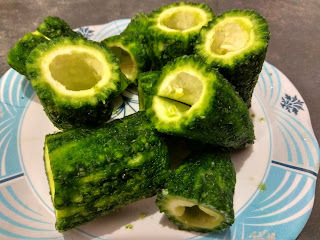 This blog showed different picture recipes.I like the bitter gourd. I shared post in many social sites. It is best service provide in 24 hour Des Moines Towing. Thanks for sharing.